Our Single Phase Motor Starter are specially designed to protect submersible and mono-block Pumps from over-loading and short circuit. 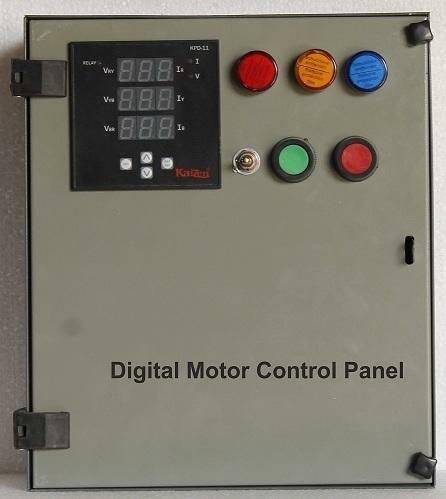 The Submersible Motor Pump Starter and Automatic Panels manufactured by us also protect the pump against Single Phasing, Phase Failure and Phase Reversal etc. Established in the year 1998. We, “Kaizen Electricals” are a renowned Manufacturer, exporter and Supplier of optimum quality Electrical Panels and Boards. Ours' is a Sole Proprietorship [Individual] organization based at Ahmadabad – 380 025, Gujarat State, India. All our products are manufactured in compliance with industry's norms & standards using premium quality material. Enriched by a vast industry experience of 18 years, we have been able to establish ourselves as a distinguished Manufacturer and Supplier of an incredible range of Electrical Panels and Boards. Our broad gamut encompasses Control Panel Boards, Automation Panel, LT Panel Alias Feeder Pillar, Pump Control Panel Board and Distribution Board. These products are manufactured by using high quality material at par with the latest technological developments in the market. Our range is highly appreciated for its longer functional life, low maintenance, energy efficiency, technical effectiveness, reliability and smooth operations. The perfect blend of technological skills and Managerial talents help us to grow day by day. We have the complete in house facility for testing all related equipments for conducting Electricals test, ICL & the Company has audited the quality control system. Our products have also testing at CPRL, ERDA & EQDC.“KAIZEN” Products are approved and used in important Government Organizations like GWSSB and Other Government Sector; GMDS, SMC., H.A.L. Ltd., R&B and Export etc. and OEM Client. We are the approved register vendor in GWSSB upto 100 HP. “KAIZEN” focus to expand the business by providing consistent good quality as well as timely scheduled deliveries to their clients. “KAIZEN” has already made a mark in the Global market and now enjoys the status of Government recognized “EXPORT HOUSE”. We have hired diligent professionals who greatly support us in all our business process. The sophisticated infrastructure established by us, help us in carrying out varied activities systematically. This facility is armed with high-tech machinery and advanced technologies that help us to develop the products in strict compliance with the set industry guidelines. Further, the quality controllers of our team stringently inspect the products on certain well-defined parameters before the final dispatch. Moreover, we customize these products on the basis of the detailed specifications by the clients.